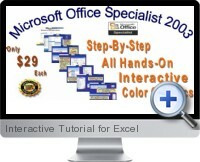 The Interactive Tutorial for Excel is a course for learning to use Excel. The Microsoft Excel tutorial covers everything you need to quickly learn all the major features and functionality and how to create and modify an Excel spreadsheet. The interactive Excel tutorial is very visual and interactive; Each Microsoft Excel tutorial has hundreds of step-by-step, all hands-on lessons. The Interactive Tutorial for Excel is a great way to establish a strong Office foundation that will help you prepare for the Microsoft Office Specialist exam; increase productivity and perform better in school, at work, or at home.